I grew up snowboarding at night. After school we’d walk down the street to the park where there was a small hill. When we got old, we’d drive. Bums. Once a sledding hill, the city later plowed snow up and planted trees to keep sledders off. This of course made it better for us – we were the only ones there. Most nights, that’s where winter was spent. And other night spots illuminated by street lights. And sometimes an hour away at what was then Rib Mountain. Nights are cold during the winter in Wisconsin. And quiet. Waterworks: The main attraction when the city pushed up the snow just right. I learned a few tricks here. And ran into the fire hydrant a number of times. Rodeos and stacked picnic tables. Waxing required to make it through the flats. Also the location of the infamous pole trick in the Noma sledding days. Gazebo: It had a handicap ramp that with a good push off gave just enough speed to sleep cross a couple picnic tables with a run out onto the frozen river. 50-50 the first bench, step up to lipslide on the second table. Werner’s: Friendly neighbors shared their epic backyard. Flat landings and lots of walking. Junkyard: Somewhat short lived. There was a guard rail that happened to get snow from the lot plowed up next to it. From the top, just enough speed for fun. Ended abruptly with owner showing up driving an end-loader and kicking us out, taking down my license plate and calling the police who later that evening visited my home. AmericInn: They cut down a tree and the log happen to sit at the bottom of a small slope for a few weeks. Knobby as hell. Run out into the sidewalk and street, stoplights just 30 feet away. Urban snowboarding in 1997. Angel flight: More a dream than any real shredding. Steep, wrecked triple set. My first year out of high school was pretty limited for night shredding. Significant memory is wrecking hard at Trollhaugen on solid ice. Later, in Colorado, whenever there was a trace of snow (or blizzard) in Denver we’d find something to do. Or staying in the mountains we’d jump off balconies. Or go to Keystone. But mostly it was daytime only. Sunny. Then moved about 15 minutes from Granite Peak. Old stomping grounds. 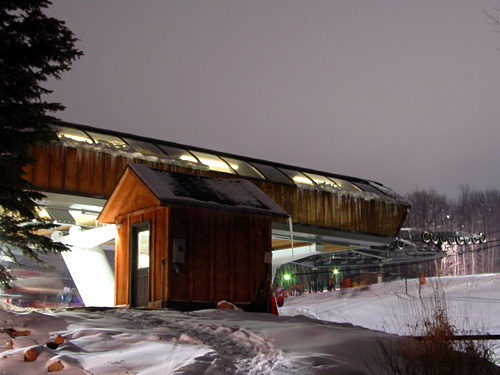 Again, many winter nights spent on a chairlift. Until, you know, another abrupt end, this time in fury. The other night I went snowboarding under darkness for the first time in about 4 years. It was pleasant. The crowds were small, the roads weren’t backed up and it made me think about all of the above. The neat thing about being at a resort at night is the contrast from the immense open view during the day compared to the very closed in, playground-like state at night. The runs are lit but quickly fade from a texture of pines to complete black. man that angel flight set looks as frightening now as it did back then! fun trip down memory lane. lots of good times with you and Mr. Bohn sliding down those hills/tables.